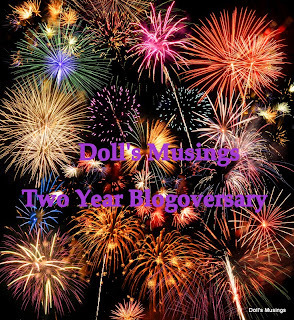 Doll's Musings: Two Year Blogoversary!! On September 12th, I will have been blogging for two years! Wow, how times flies by. I think I have whiplash right?! So in order to celebrate my blog's birthday I will be putting on a fabulous giveaway prize!! I have thought lots about this in August and have mulled over some ideas. This time, since I have limited time with my new job, I'm going to keep it simple and offer a $20 Gift Certificate to 123stitch.com! Does that sound good??!?! I also will have a 2nd and 3rd drawing and will send the winners a little something as well. It could be threads, trims or fabric. Not sure what yet but I hope you won't be disappointed! Now for the "rules" part. I've also given this some thought and would like to reward those who have been my regular readers and will include last post's comments as another entry. You can have another entry if you comment on my posts from now until the Giveaway time! I probably will only post 1-3 times before the giveaway so don't worry!!! I'm either going to draw by paper or do that random generator thing. A BIG THANK YOU TO ALL OF MY LOVELY FOLLOWERS!!!!!! I truly appreciate all the wonderful friendships and kindness that has come my way. I am very blessed. Happy blogoversary! A great giveaway - count me in - and thank you for the offer! I am having a Blogoversary giveaway on my blog which ends tomorrow at midnight, if you are interested. Congrats on your 2nd Blogoversary! Sure would love to join your giveaway, thank you for the chance! Congratulations on your second Blogaversary. I would love to be included in your giveaway. I am a follower. That is sad news about Vikki Clayton's silks :( Thanks for sharing that. Happy Blogoversary!! Please enter me in your drawing. I know that I have been a bad girl and not commenting lately but I have been reading even though I haven't even done a blog update of my own. I do enjoy reading your blog posts. Put me in Titus's hat for a drawing too! Congrats on your 2 years. Pls enter me in the drawing, I am already a follower. Happy 2nd yr of Blog Anniversary! Very pretty sampler you've been stitching (got to see photo of previous post). Wow, two years! That's fantastic. I didn't realize you'd been blogging for that long. Congrats, Anne! great opportunity and count me in! Congratulations on your two years blogging. What a great giveaway prize you are offering. I'd love to enter the draw please and yes, I'm a happy follower. Congratulations on two years!! It has been fun following you and readinng of all your adventures. Thanks for the chance at your giveway! So glad you are blogging! Congrats on two years! I follow and would love to be entered. Having a cuppa tea and lifting it up to you wishing you a happy day. I always enjoy reaing your blog. I would be thrilled to be included in your giveaway! What a great trip! But not for me--I like COMFORT! And my iphone! Love the picture of the rainbow--we had a double rainbow last Thursday evening! So amazing! Congrats on your 2nd Blogoversary! Isn't blogging fun? I absolutely love it! Going on 5 years next February! Cannot say anyone has stuck to FB or Twitter as long! Please enter me in your giveaway! Would love to win! Hugs! Happy Blogiversary! Please enter me in your giveaway! Happy 2nd Blogiversary!! I'd love to help you celebrate :-) Thanks so much for the chance at your give-away! Yay Blogoversary! Thanks for the giveaway, I'd love to be entered! I'm so excited for your blogoversary (I actually forgot mine this year, eek!). That's great Anne, I would like to enter the drawing. I follow your blog for quite some time now and it always give me pleasure to read! Happy blogoversary! Such a wonderful prize too...please count me in! Happy Blogoversary and welcome back from your trip! I really enjoyed seeing all you pictures in the post above. Welcome back and congratulations on your blogoversary! It seems a great giveaway - I am rather far from you but happy to be in! I'll arrange an announcement on my blog too! Congrats on your upcoming 2 year blogversary! I think I've been reading and following the entire time. Time flies, doesn't it? Two years!! Congratulations! :). Thanks for dropping by and entering my giveaway too! Hi, thank you for stopping by my blog :D It was lovely to have you visit. We share a blog birthday! that is pretty cool. Congratulations on have reached two years. Brilliant stuff. Congrats on getting to two years blogging - I always enjoy reading your posts. I can't believe it's been two years--how time flies!! 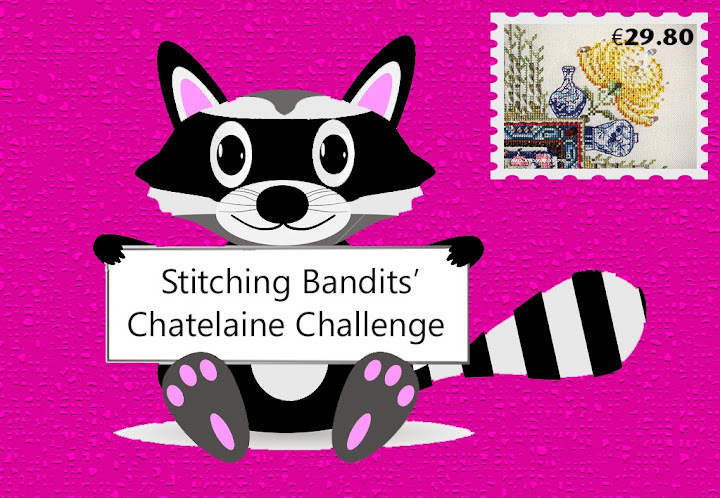 Congratulations, Anne, and count me in on the drawing--I love 123 Stitch!! Happy 2 year anniversary and thank you for a chance to win a truly wonderful prize. Happy Blogaversary, Anne Doll, you are a doll and it is great to be your friend in blogland. Please count me in and I will put your giveaway on my sidebar. Hi. I just found your blog and became a follower. Happy to years. I would love to be entered in your giveaway. I just found you, but I'm loving your blog already! Super huge congratulations on reaching your 2nd blogoversary! New follower here (officially, that is! I've been reading for awhile;) I'd love to be entered in your giveaway! Congrats on your Blogoversary, and thanks for the contest! Happy Blogoversary! Time flies by quickly, doesn't it? I don't know about you, but I've met so many wonderful friends through blogging. It's so wonderful finding like-minded friends! I'm so far behind my blog reading! Hope you had a good blogaversary anyway! Hi Anne, I am a brand new follower and look forward to reading lots more of your blog. I would love a chance in your giveaway...thanks so much for the opportunity! Good for you, Happy 2nd Blogversary! I totally missed mine, maybe next year! Shopping from 123Stitch is always a treat! Happy 2 years!! Good luck with your class this year and say hi to Titus. hi! i just joined - you have a lovely blog. my first job was teaching and i have the same problem as you - i'm woefully behind all the blogs that i follow! good luck with catching up, to both of us! Happy 2nd blogoversary. Thank you for your giveaway, I would loved to be entered. Gosh, how did I miss this. I'd love to be entered! Happy 2nd Blogoversary!! I would love to be entered into your drawing! Happy blogaversary! Please count me in. Very nice present.